At a high level, the book traces the history of Superman from Jerry Siegel and Joe Shuster's upbringing in Cleveland through DC's "New 52" event. Tye covers not just the comics, but the serials, movies, TV and radio shows as well as the promotional items that managed to slap Superman's image on it. Tye addresses both the creative decisions, as well as the legal and personal ones that fall outside the realm of the Superman stories themselves. So, not surprisingly, it's a reasonably thick book at 432 pages, although the last 100 or so are the Appendix and Index. I'm no Superman expert, by any means. I've only got a few dozen issues of Superman and Action Comics and I don't think I've seen any of the shows or movies in maybe 15 years. I've briefly considered going to Superman Celebration a couple of times, but never did because the six hour drive didn't seem worth it for me. That said, I am more than passingly familiar with the history here, so a lot of what Tye chronicles wasn't new for me. Certainly not the broad strokes. I think the biggest thing I walked away from the book learning was many of the legal issues that came up specifically around the first Christopher Reeve movie. So the book struck me as a bit odd in that respect. Tye even notes as much in his Acknowledgments: "Why did the world, which already had two hundred books about the comics and their leading man, need two hundred and one?" Tye claimed that none of them included a "full-fledged account that approaches him as if he were human". I don't have a huge library of Superman books, as I've suggested, but I have trouble believing that no one has covered everything Tye covers in one book before, with the possible exception of the most recent events. Maybe I'm wrong on that front but, as I said, very little came across as new information to me. One of the difficulties inherent in tackling a subject like Superman is that, unlike a real person's biography, many things were going with Superman simultaneously. Both the Fleischer cartoons and the Kirk Alyn serials, for example, overlapped with the Bud Collyer radio program. Later, the Super Friends cartoon was on the air during the filming and release of the first three Reeve movies. So a strict chronological organization would be difficult, at best, and would almost inevitably wind up being confusing for the reader. Tye, therefore, tends to chunk the details on more of a project by project basis. He talks about the radio show first, then goes back to talk about the Fleischer cartoons, and then goes on to the serials. But even in that context, there wind up being some uncomfortable segues and he still darts back and forth a bit more than he should need to. Especially given that he keeps returning to the lives of Siegel and Shuster periodically. It's not terribly difficult to sort the chronology, as he provides context throughout, but it gets a little dicey, especially towards the beginning of the 21st century when more and more projects are going on simultaneously. Maybe Tye was right about no one ever collecting everything into one book before. Maybe it's not because other people haven't tried, but because they realized it was too big to include everything in one book. 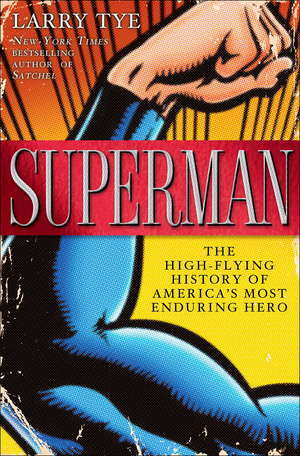 "The superhero was back onstage in Dallas, a featured attraction in Warner Bros.' bustling store in Shanghai, a prominent player in movies as eclectic as Kill Bill and Hollywoodland, the focus of college courses on everything from sociology and immigration to gender studies, and a centerpiece exhibition at Jewish museums in Berlin, Paris, and Amsterdam." Maybe that's too much for one book. Tye's book tries to be as comprehensive as possible, and I'm sure that all but the most avid Superman aficionados will find something new. My biggest complaint about the book is that, in trying to be comprehensive, it winds up being a little more convoluted than necessary. The book is broader than it is deep, not surprisingly, and Tye's attempt makes me think the Man of Steel has outgrown his ability to be fully captured in a single volume. Superman: The High-Flying History of America's Most Enduring Herois available now and retails for $27.00 (although it looks like many online retailers are discounting it to around $18.00 currently).